What is the distributor supposed to do? The distributor has two functions; one is to switch current through the coil at the right time, the actual timing varies with engine speed, and the other is to act as a rotary switch to send the spark to the correct plug, one at a time. On the subject of timing, the reason why the time at which the spark is generated is important is because the fuel/air mixture in the cylinder doesn’t burn instantaneously. It is pretty quick, but it is a burn and not a bang. 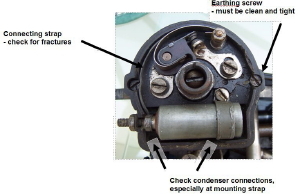 During the induction part of the engine cycle, the fuel/air mixture is drawn into the cylinder via the inlet valve. As the crankshaft rotates, the piston rises back up towards the cylinder head with the valves closed, putting the mixture under compression. At an appropriate position of the piston, the mixture is ignited by the spark, which is initiated by the points opening, and it begins to burn. The burning mixture releases lots of gas which pushes on the top of the piston, sending it back down the cylinder. It is the expansion of this gas that gives the engine its power. 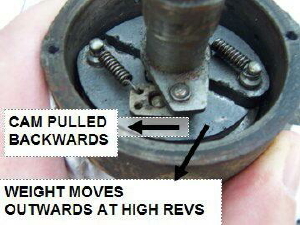 Finally, the exhaust valve opens and the piston, rising due to the momentum of the flywheel, pushes the now waste gas out of the exhaust port. Now consider the moment at which the mixture starts to burn. The time for which the mixture burns is more or less constant, irrespective of engine speed. However, the faster the engine is running, the faster the piston is moving, and so the shorter the time over which the piston is travelling down in the power stroke. That means we need a mechanism to ensure that we get the best synchronisation of the burning of the fuel to the travel of the piston, and that the synchronisation is speed dependent. The burn takes place in two stages. When the spark first goes off, the mixture starts to burn at the plug, with a flame spreading outwards through the mixture. This action doesn’t produce any power, but subsequently, the whole of the mixture burns and exhaust gas is produced throughout the part of the cylinder between the top of the piston and the head. This gas expands and produces the power. The key to the distributor timing is to make sure that this second stage occurs when the piston is physically in the right place in the cylinder. The spark is made by a collapsing magnetic field in the coil. This happens at the instant when the points are opened by the cam pressing on the insulating heel. 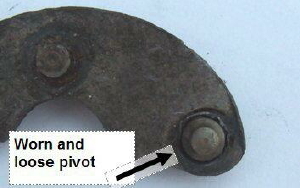 The variation in the timing is produced by a mechanism under the plate with the points mounted on it. What happens is that the cam is rotated relative to the driveshaft by a pair of spring loaded bob weights, with the rotation being governed by the engine revs. At low engine speeds, the centrifugal force on the weights is not sufficient to overcome the spring force, and the cam is held in one position with respect to the drive into the distributor, and hence in one position with respect to the engine camshaft. This sets the latest time that the points will open; the ignition is said to be “retarded”. 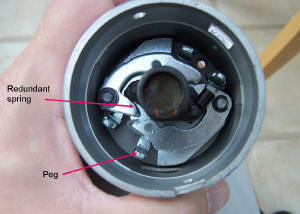 In this position, the piston is allowed to travel past “top dead centre” (TDC), and the power occurs whilst the piston is already travelling back down. This is desirable at very low engine speeds; it generates less power but makes the engine easier to start and runs much more smoothly. Ideal for tick-over. At high engine speeds, the time for which the fuel takes to burn now becomes significant compared to the time it takes the piston to travel down the bore. If the spark occurred at the same point as described above, the piston would have travelled a long way down the bore before the gas expands, there would be no pressure in the cylinder and no “push” on the top of the piston. Net result: no power. So, the cam is rotated by the bob-weights overcoming the spring force, the points are opened earlier and the spark happens earlier. The ignition is said to be “advanced”. At the highest of speeds, the piston is travelling so fast that it is necessary to start the burning process before the piston has even reached the top of the cylinder. The flame spreads across the mixture and the gas starts to expand a few milliseconds later, just as the piston has passed over TDC and is beginning to travel back down. Now the piston has the maximum pressure on it and the power is at its greatest. Where it can all go wrong is if the spark is too early. Then the expanding gas will try to stop the piston from coming up prior to the power stroke, and have a feeble push at the end of the cycle. The engine will feel very harsh and sound “clattery”. How is all this set up? There are three parts to the timing: static timing, dwell and advance. * Static timing is the initial position of the cam at which the points are just beginning to open. Static timing defines the fully retarded position, as the engine is either stationary of rotating at very low speed – usually on the starting handle. The absolute best way to set this is to measure with a lamp and battery or a strobe lamp the precise angular position where the points open and compare it with a known timing mark on the crankshaft pulley referenced to a marker on the engine case. This has to be done once when the distributor is first fitted, though it is possible to fine tune the position of the distributor by ear. Once the distributor is mounted in the right place, maintenance of the correct static timing is done by ensuring that the gap is correct. VITAL INFORMATION: because the cam is a slightly different profile, the correct gap for the points on the Bosch distributor is 16 thou, NOT 12 thou as for the Lucas. This matters a lot: if the gap is set to 12 thou instead of 16, then the points will open too late and not stay open long enough. This affects the static timing and the dwell angle. * Dwell angle is the amount the cam, which is under the rotor arm, can rotate without the points being open at all, and determines how long current is allowed to flow through the coil. Too small an angle and the magnetic field won’t build up between sparks. Too big an angle and the coil is put under more stress and the condenser has to work harder. Dwell angle is set by the shape of the cam and the gap on the points. The perfect dwell angle is 60 degrees, meaning that the points are closed for 2/3 of the rotation (90 degrees is the point at which the next cylinder will fire). Because all of this is adjusted by the profile of the cam and the gap, then if the points gap is correct, then the dwell angle is set by default. Again, too small a gap will cause the points to stay shut too long - the dwell angle will be too large. * Advance is the angular movement of the cam as a function of engine revs. Timing and ignition advance is set by one of three possible mechanisms, dependent on which type of distributor is fitted, a manual Lucas DJ4, Lucas automatic DK4 series or Bosch. 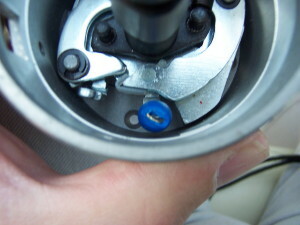 The manual Lucas distributor, the DJ4, fitted to Box Saloons and other cars with an IGN lever, has a maximum mechanical swing of about 18 degrees. However, this doesn’t really equate to an advance of 18 degrees in practice. The lever is swung fully retarded to start the car, when the sole requirement is to get an easy tick-over but without producing any power. For the benefit of hand starting, this means that if the engine misfires, it will rotate forwards, and not risk injuring the starter. Once the engine is running, the lever is adjusted by hand to an advanced position, where usually it is left alone for the remainder of the journey. Thus for normal running, the change in timing between tick-over and full speed is actually zero. Fine tuning and tweaking is at the behest of the driver. Simple, basic but effective. From the Ruby onwards, a driver aid was fitted that did away for the necessity of adjusting the timing by hand to start the car. The Lucas DK4A series have an automatic mechanism that also varies the timing a little bit, some 8 degrees, in relation to the engine speed. As compression ratios were increased and fuels improved, the later cars’ mechanism allowed more advance at 12 degrees. This gives a little bit more power at high revs and a little bit smoother tick-over when combined with the higher compression engines. How it works in that the shaft having the cam to operate the points is allowed to rotate around the spindle from the dynamo, and hence the engine camshaft, with its position being controlled by bob-weights and springs. The photos show the two shafts and how the weights and springs are arranged. 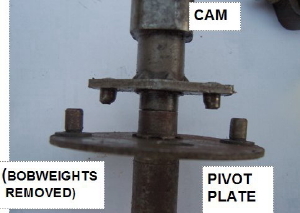 The bob-weights are attached to a pivot plate at the points at which the springs are anchored. The weights push outwards under the centrifugal force of the pivot plate rotation. They are held in check by the springs. As they move outwards, there is a second pivot mechanism that rotates the cam with respect to the pivot plate. The faster the engine runs, the more the weights move outwards and the further back the cam is rotated - to the fully advanced position. What’s wrong with the Lucas Distributor? Basically, wear, because when they were new they were fine. 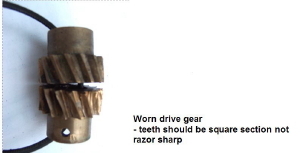 The manual DJ4s are so basic that the only things that can interfere with the timing as adjusted by the driver is if the clamp is sufficiently loose that the whole distributor can move in the socket in the dynamo, the advance lever linkage is worn and floppy, although this is easily cured with a spring to remove backlash, or if the drive gear has been so badly worn as to allow excessive axial movement. A worn spindle or bushes will allow the cam to move about under the pressure from the points, causing the gap to vary from moment to moment, upsetting both the timing and the dwell. The automatics suffer from the same bush and spindle wear but have an additional “Achilles Heel”. The problem with 99% of the DK4s is that the bob-weights will have worn a bigger hole in the base-plate than is necessary, allowing the timing to flop about, or that the springs will have weakened causing the advance to happen too early. There are another couple of old-age snags with Lucas distributors, but which are more easily dealt with. The base of the points must be in good contact with earth for the switching action to be operating correctly. 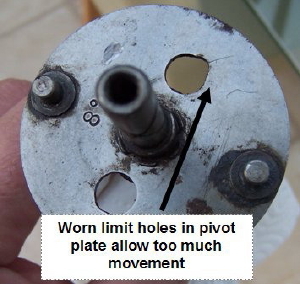 The Bakelite base-plate makes its earth through one small screw, which must be clean and tight for the points to pass the current from the coil. Also, it’s not unknown for the connecting strap to fracture. For both Lucas types, the condensers are simple tubes of aluminium foil insulated by impregnated paper. These don’t age well, and are nowhere near as reliable as modern polyester devices. One of the common tweaks for the Austin Seven is to fit a Bosch 009 Distributor. There are undoubtedly some benefits to be gained by choosing this option, not least that you get a nice new unworn assembly, with parts that rotate smoothly without slopping about, modern materials in the condenser and distributor cap that will be much more tolerant of the electrical stresses of the HT system and, of course, the ability to pick up spare points at any Halfords! However, do not be tempted just to buy one and fit it. The much higher compression ratios in Volkswagen Beetles allow a MUCH wider advance range: an unmodified Bosch distributor has an advance range of approximately 22 degrees, which is far too much for the lower revving, lower compression, Austin engines. 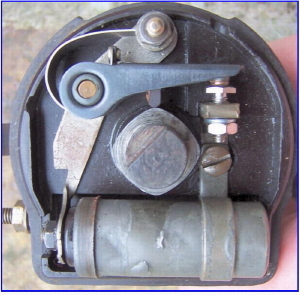 If an unmodified Bosch distributor is fitted to an Austin, and tuned so that at maximum advance it doesn’t “pink”, then the ignition will be much too retarded at lower revs. This means that the car will have no mid-range “go”; it will tick over nicely; if you can get up to screaming revs it will produce enough power but in the middle, there will be very poor acceleration, especially in third or fourth gear. Thankfully, there is a simple cure. Before you fit your new distributor, remembering that it needs a 16 thou gap NOT the 12 thou for the Lucas, take the cap and rotor off. Underneath, you will see a pressed plate held in place by the two screws that hold the clips for the cap. Under this plate is the bob-weight mechanism. Remove the two screws, plus the screw that holds the condenser in place. Now the points mounting plate can be lifted out. The maximum advance is set by the position of the bent up part of the base-plate which the bob-weight bears up against. All that is necessary is to make this vertical part fatter and so restrict the range of advance. 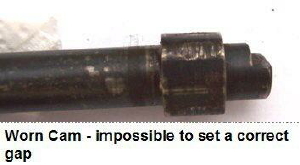 There are a number of ways of doing this; a couple of favourites are to crimp a short length of ¼” copper fuel pipe over the post, held on with a tiny hole in the post and a split pin, or to use a cut-down electrical bullet connector female crimped over the post. For this method, take an insulated female bullet, cut off the portion that usually accepts the wire and use the rest. Either way will reduce the range to about 10 degrees, which is fine. 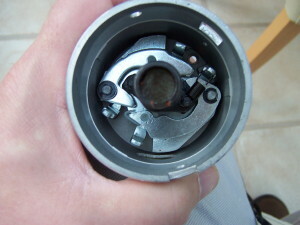 The Bosch comes with a non-insulated blade connector instead of a screw terminal to connect to the coil; if this shorts to ground the car will misfire and stop so make sure that a good insulated connection is made to the coil. So, three types of distributor, all with strengths and weaknesses. The choice is entirely yours. This article, written by Geoff Hardman and Andrew Jarmin, originally appeared in CA7C Seven Focus in July 2009 pp22-24, and Aug 2009 pp23-26. I have read your article re Bosch distributors and I am fitting an 009 to my A7 rebuild with a slightly pepped-up engine. I have noticed that the two springs on the centrifugal weights are different. One has a lot of slack and only starts to be tensioned towards the end of the advance movement. I hoped that, with your Bosch experience you would know if this is correct as I cannot find anything online. I expected both springs to be the same. Also I have lost my record of which Ebay trader I bought the unit from over a year ago so I cannot ask them.....the rebuild ambitious schedule does not meet the reality!! 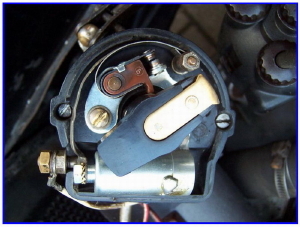 A second question re your bullet connector modification.....the 'pin' you reference is, I think a bent up peg of the advance mechanism base plate...is that right? Secondly I suppose one puts a bullet connector on both pegs? Your Bosch is perfectly correct. The reason for one tight(ish) and one floppy spring is to put a “knee” in the advance characteristic. For the first part of the advance, from low revs (and the part you will be using on your Seven), only one spring is doing any work. Thus the cam advances as a simple function of revs – up to a point. After that, the second spring has had its slack taken up. Now the two are acting together and are therefore stiffer, so you get a lower “advance angle per unit increase in revs”. So, in effect, the midpoint of advance comes on soon after tickover, then the final advance only when you are revving the doodads off it. This is exactly right – for the VOLKSWAGON. Hence the mod for the Seven. Spot on, the bent up baseplate is the peg. If you operate the mechanism by hand, you’ll see the nylon buffer on the bobweight move towards the bent up bit and eventually hit it. This is WAY too much advance for the Seven, being from memory about 26 degrees. So, popping the crimp end over the peg sets a stop to limit the advance to about half that. (The second spring probably hasn’t taken up any slack by this point – of no consequence). Both pegs? No. Only one of them has the nylon buffer hitting it. DON’T put one on the spring hanger. I’ve attached two higher resolution photos to explain. 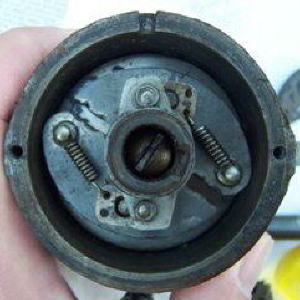 Before Mods (left) – you’ll see the nylon “shoe” at the 7o’clock position and the advance end stop. You’ll also notice only one spring – the loose floppy one can be taken off as you’ll never exercise it. Keep it in case you want to try race tuning..but remember then that it’ll be too retarded at idle, and will run rough as rats (if it starts at all). After mods (right) shows the peg you need to modify. .